It's finally sunny today and not a minute too soon. We’ve been living through the monsoon season on Cape Cod – the frigid version. With the weather still firmly in comfort food territory, I decided to bring in some Florida sunshine in the form of citrus to brighten my usual weeknight repertoire. Yeah, I think so too, and they sure did make a plain old chicken shine. This is such a simple dish, it shouldn’t even need a recipe. But just in case, I did provide one at the bottom of this post. This winter I've started making my own chicken stock. We use so much of it, it’s a must have in our pantry or fridge – and free is good. It’s so easy I don’t why I haven't always done this. After I roast a chicken, I just throw the leftover bones in a pot. I rough cut an onion and some celery stalks and add any pan drippings leftover from dinner on the nights that I don’t make gravy. I let the chicken stock simmer for about three hours and then I strain it. So simple, but the citrus element of this dinner made me wonder what to do with the stock. I had a pan full of rich looking juice that I did not use for gravy, and I wasn’t about to waste those lovely bones. I remembered that Greek chicken soup has lemon in it, so I decided to create my own version using ingredients I had on hand. It turned out just fine and had more flavor than my usual chicken soup. We originally had enough leftover chicken to make the soup, but I live in a house full of teenagers (who mimic locusts every time they open the fridge), and that chicken was gobbled up in quesadillas as an afternoon snack the next day. Determined to make my soup anyway, I used two boneless chicken breasts instead of the leftover chicken, which still made it an affordable dinner. Wash chicken and pat dry. Place in dark enamel roasting pan. Mix three citrus juices together and ladle over chicken. Stuff leftover citrus rinds in chicken cavity. Season chicken with herb blend, salt and pepper. Bake at 350 degrees for one hour. Reserve pan juices and carcass to make stock. In a large Dutch oven, heat up chicken stock and water. 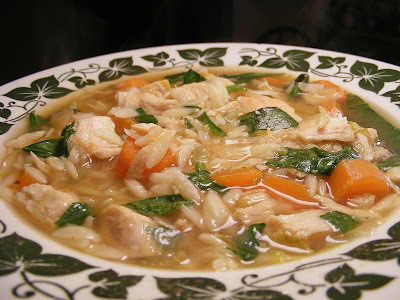 (If using raw chicken, poach two breasts for 30 minutes in broth. Remove to cool and then dice and reserve.) Toss in the oregano, salt and pepper, and add the onion, celery and carrots. Give it a good stir and then simmer for 30 to 40 minutes. Add diced chicken (either fresh cooked or leftovers) and heat for about ten minutes. Stir in the baby spinach and orzo and cook 2 – 4 minutes, until spinach is wilted and orzo is heated through. I'm still freezing! Where the hell is spring? Knowing our luck we'll go right into summer very soon, like we always do here on the cape. Didn't that sun feel good today? 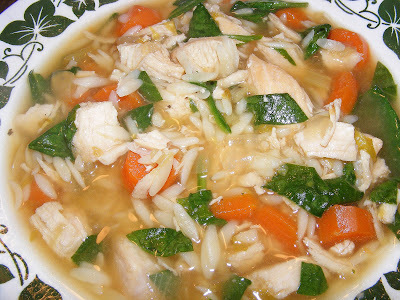 Never heard of greek chicken soup, but it really does look good. I'm being good lately; eating right or rather eating less junk. so many amazing citruses! i love the soup!!! Looks delicious! That soup...OMG heaven...simply heaven. It's been kind of chilly here, so much so that I wanted soup for dinner. Yours looks wonderful and comforting! I bet it had great flavor from the delicious and gorgeous chicken you made! Isn't a fat, roasted chicken like that just the best thing in the world? Beautiful! Laurie this whole meal is fantastic! The photos are beautiful! I agree with Dawn, we've had way too much cold weather this Spring! Both of these dishes look fabulous, but OMG that soup, I want that soup, I want at least one bowl, loooks so delicious.. Greek chicken soup, must try that! 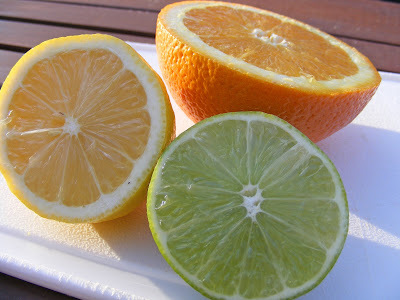 I really love your citrus picture! 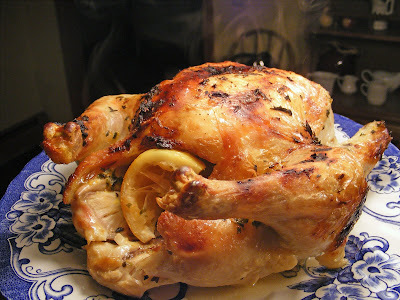 There is nothing like lemon and chicken - a fabulous combination! Looks delicious! The soup too! Nothing better than a great homemade stock... seriously. And I love a nice Greek Chicken Soup. All the best stuff in one place. Bet this would do wonders for the nasty cold I've been trying to get rid of!